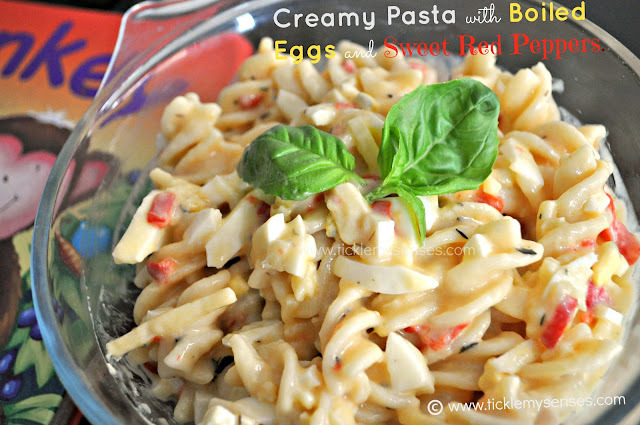 Tickle My Senses: Fusili pasta with Red peppers and Boiled Eggs. Its been ages since we had Toddler/ Kid friendly recipes posted here. Apologies! Well this pasta recipe is one I created on a busy afternoon, when all that I had left in the fridge was a red pepper and eggs (fortunately both are well palated by Baby A). I simply sauteed the pepper with some chopped onions, tomatoes and herbs, added the pasta, enough water and cooked till done. Then added the finishing touches of cheese, a dash of cream and chopped boiled eggs. 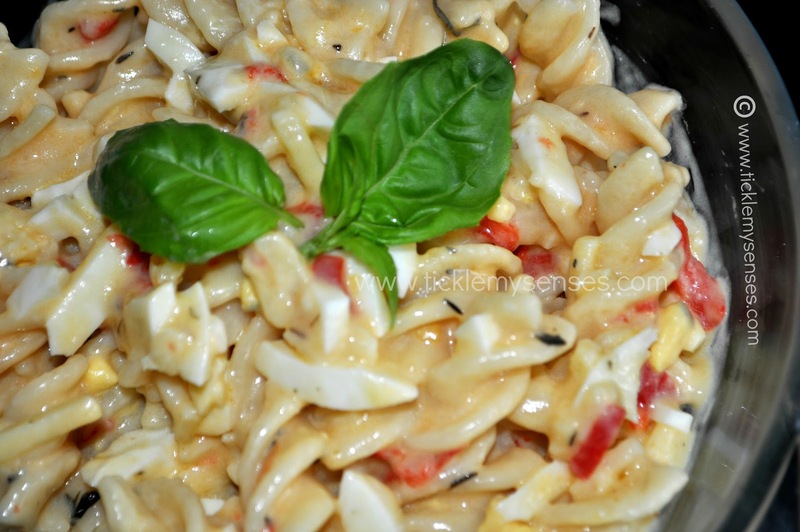 Must say the pasta turned out really soft, creamy and wonderfully flavoured by the red peppers and herbs. It was very well received by Baby A's friends who came to visit too. Cooking the pasta in the cooker is not only quicker, allows the pasta to be cooked softer and most importantly saves up on washing up ;). To make Fusili pasta with Red peppers and Boiled eggs. 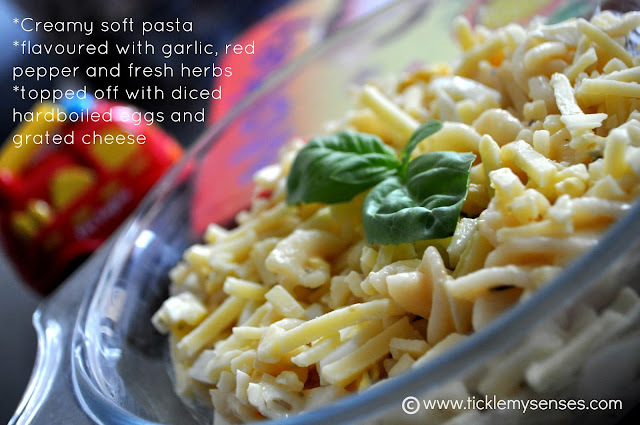 Serves 3-4 children | Preparation time: 10 minutes | Cooking time: 30 minutes. Boiled eggs: 2 hardboiled and finely diced. 1. Place eggs in a large pot of room temp water, enough to cover the eggs. Add a dash of salt and a tsp of vinegar to the water. Turn heat to high. When water comes to a boil, cook for further 10 minutes. Once the eggs are done. Turn flame off. Carefully drain out hot water and replace with cold water.After 5 minutes peel shells and dice the eggs. Keep aside. 2. While eggs are boiling, take the base of a pressure cooker. Add oil, when hot add the garlic and fry for a couple seconds till lighly softened. Add the diced peppers, chopped tomatoes and onions, add salt, fry well till onions and tomatoes are somewhat soft (around 4-5 minutes) on a medium flame. 3. Add the chopped thyme, chopped basil, stir, add the uncooked pasta and mix well. Add hot water to cover pasta well above 1 inch, mix. Taste for salt, add as required. Close cooker, cook for 1 whistle on high heat. Turn heat to simmer and cook for further 6-7 minutes. Turn off the pressure cooker heat and allow pressure to drop. Once the pressure has dropped, open the cooker add a dash of cream, grated cheddar, the chopped boiled eggs and mix well. You could serve the pasta straightaway. I prefer to allow the pasta to rest a few more minutes to plump up a bit and absorb all the flavours. Close the pressure cooker lid place the weight on and allow the pasta to rest (with no flame) for a further 10 mins, while you go about doing other things. Once 10 mins is up, open the cooker, stir well. Serve warm. Thats all for now friends. I hope your kids do enjoy. Shall leave you with a few more loved Kids recipes !